Who wants to own a fully autonomous car? According to a survey conducted in 2014, about 23 percent of respondents said they were very likely to buy a fully autonomous car. A slightly smaller share (21 percent) stated that they were likely to buy an autonomous car, while another 21 percent were neutral about the question. 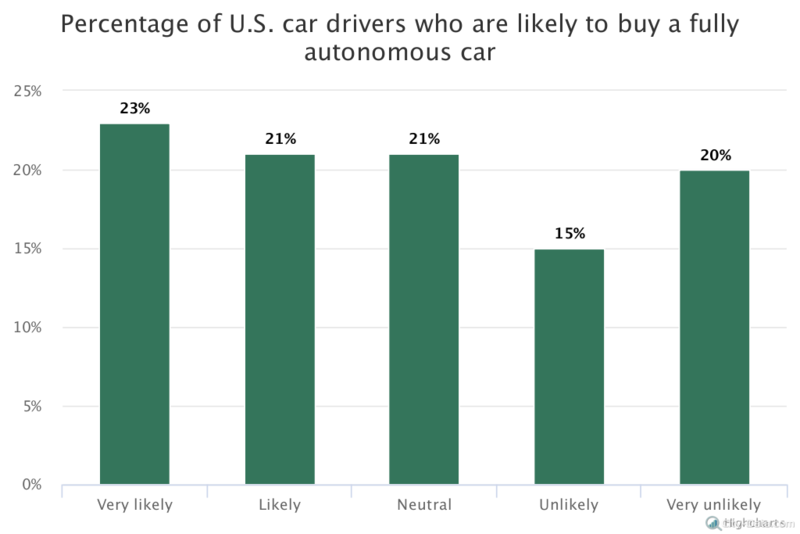 About 15 percent of American drivers said that they were unlikely to buy a fully autonomous car, while 20 percent stated that they were very unlikely to buy this type of car. 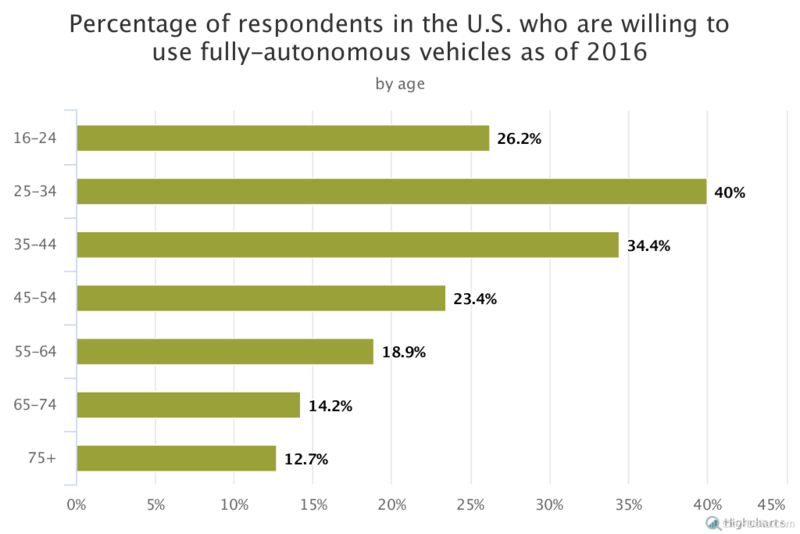 Now let’s have a look at the results of a 2016 survey on American respondents’ willingness to use fully-autonomous cars (the results of the survey were broken down by age). Over 26 percent of people between the ages of 16 and 24 said they were willing to use fully-autonomous vehicles. A higher number was recorded among people between the ages of 25 and 34 (40 percent), while the “willingness index” of the 35 to 44 age group amounted to 34 percent. About 23 percent of people aged between 45 and 54 stated they were willing to take a ride a fully autonomous vehicle. People’s willingness to ride in fully autonomous vehicles decreased with age — less than 19 percent of people between 55 and 64 years old were comfortable riding in them. Older age groups were even less enthusiastic about riding in fully autonomous cars: only 14.2 percent of people between 65 and 74 would ride in fully autonomous cars. The idea was even less popular among the oldest (75 years and older) respondents: less than 13 percent. 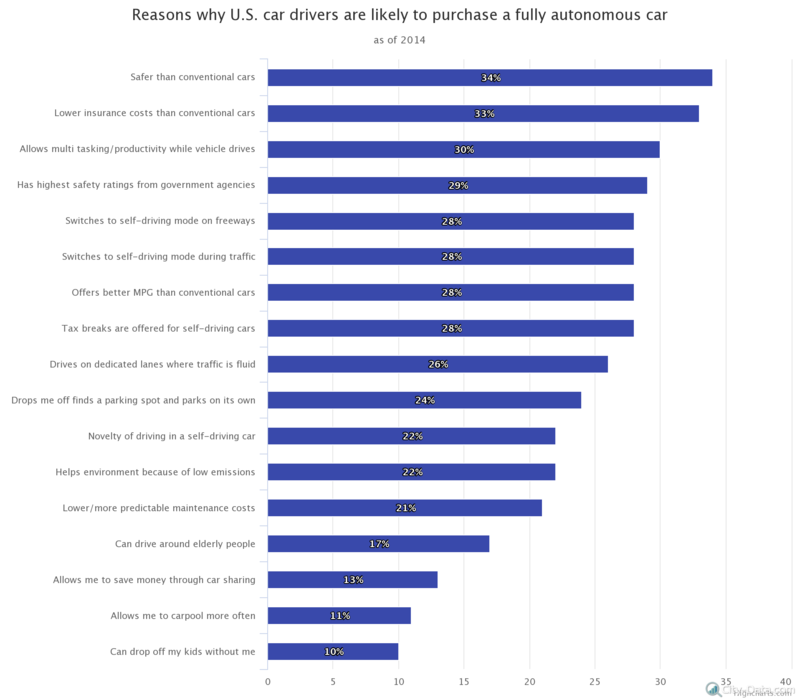 The most common reason U.S. drivers gave for their interest in purchasing a fully autonomous car is safety — about 34 percent of American drivers were likely to buy a self-driving car just because they believe it’s safer than conventional cars. Almost the same percent (33 percent) think autonomous vehicles will lower their insurance costs of this type of car, while 28 percent want the ability to use the self-driving mode during traffic.